I-Play.com is where you can try online games out, find the games you like and own them for life. If you have never played a computer game before - this is the perfect place to start. Just visit one of the many game pages on I-Play.com and either download a free trial version of the full game or play the online version right in your browser. With a large variety of top quality games of all genres, you will soon find out how fun and rewarding casual games can be. I-Play.com is constantly updating their game selections to fit your taste and preferences, so be sure to check the new games section frequently. Save on your next purchase from I-Play.com with I-Play.com discounts, I-Play.com promotions and I-Play.com savings from 58coupons.com. Enjoy 35% off on all games at I-Play.com with this coupon code. Click to view. Act now and save 25% on any game at I-Play.com. Click link to get started. 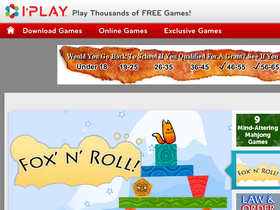 Get your game on at I-Play and choose from hundreds of games to play online for free. Click link to view games.